Monster Hunter 3 Ultimate is a re-release of the Wii version Monster Hunter Tri that introduced gamers to the world of monster hunting back in 2010. Does this remake for the 3DS and Wii U warrant the purchase price or is it simply a "been there, done that" type of game? Read on to find out. I'll be the first to admit, I was skeptical of the Wii U. I hadn't planned on purchasing one until there were more games that I was interested in. However, when I realized MH3U was to be released soon, I was truly debating purchasing the system. After reminiscing about my monster hunting days on the Wii, I finally broke down and traveled to my local Best Buy (by no means am I endorsing Best Buy...unless they want to give me money then I will totally endorse them) and purchased a Wii U. To my dismay, they didn't have MH3U, so I went to another store and picked it up there, I was bound and determined to play it. When I finally finished loading the horrendous Wii U update, I was ready to get my monster hunting on. I had my Diet Mountain Dew (trying to watch my figure lolz!) my snacks and an entire evening to dive in. After only a couple of hours in game, I remembered why I loved this game so much for my Wii. Let me give the newcomers to the Monster Hunter franchise a brief explanation of MH. In MH you fight giant monsters...what a concept I know! Anyway, you hunt monster, harvest their juicy bits to make new weapons and armor. You also gather items from the land, be it picking mushrooms, herbs, mining ore etc. in attempts to forge better items, weapons and armor to help you in your endeavors of fighting bigger and badder monsters. You take quests from a monster hunter guild to hunt monster, gather resources and things of the sort. You have a time limit to complete these quests and after completion, Stop...Hammer Time! you are rewarded with wonderful money! Completing random hunts that aren't quest driven in the forest right outside the town will also help you upgrade the small fishing village, which you will want to do since it's essentially your home in single player. That's it IrishPride!?! You bought a Wii U simply to fight monsters and forge new equipment? "Hells yes I did!" At its surface, it doesn't sound all that impressive when you play MH3U, but when you kill your very first giant monster, you will be hooked. The sense of accomplishment you get in defeating a monster is one of the most satisfying feelings I've received in a video game. 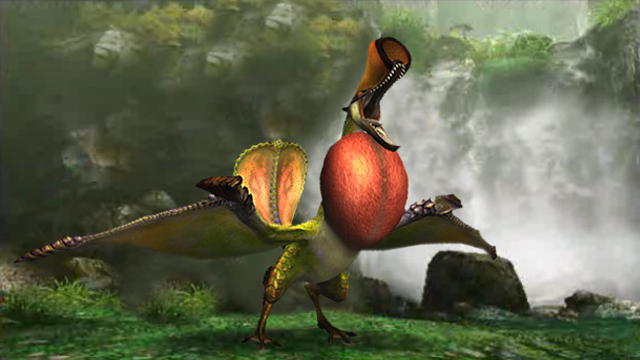 For example, one of my quests I was assigned to defeat a Qurupeco, a giant bird type monster. I had 50 minutes to complete it or I would fail. At first glance, 50 minutes seems like an eternity, but when I was fighting this gigantic beast, I had a warning flash up that I only had 15 minutes remaining. What!?! This can't be, I've been bashing the crap out of Big Bird, why isn't he dead! When fighting monsters, they don't have health bars in the traditional sense. You see visual clues that the monster is getting close to defeat. Monsters limp from one area to another on the map. They may start drooling from the mouth. It's these clues that you need to look for so you have an estimate of how much longer you have to drop the beast. Back to my Qurupeco hunt, I thought I had him almost killed because he was losing a lot of saliva from his beak region. The problem was that he knew he was injured, so after fighting for a few minutes, he would take off a fly to a different part of the map. My issue was that I didn't have any more paint balls to keep track of him. A paintball in MH3U is an item you use to mark your monster you are fighting so you can see them on your map where they run/fly off to. I had to run from area to area looking for this damn bird. I was wasting valuable time searching for my prey. When I finally would find him, we would fight for a while and he would fly off again, same old song and dance. Another warning flashed on my screen: Warning, 10 minutes remaining. My palms are now starting to become sweaty. I've spent 40 minutes tracking and hunting this beast, I don't want it to go to waste! Another warning flashes while I'm hammering away on this giant bird, 5 minutes remaining. "Just die already!" I yell at my television screen. And with one final swing of my hammer, the beast finally drops! I'm ecstatic and promptly start harvesting him before I'm transported back to town and I do a little victory dance in my room. It's these moments that MH3U digs its claws deep inside you and refuses to let go. The Qurupeco...aka Big Bird. Now, my only problem with MH3U is the weapons. The problem I have isn't necessarily the game's fault, but my own! There are too many that I want to try and forge! There are a total of 12 weapons to choose, each having their own pros and cons. Want to be able to lop off a monster tail? Bring along a Great Sword with you on your next hunt. Want to try and stagger your prey? Use a Hammer with a charged up hit across the monsters head. Are these huge weapons to slow for you? Speed up the process with the Dual Swords. You can only take one weapon with you on a hunt, but there is going to be a weapon you will fall in love with; however, don't be afraid to experiment with all of them. You begin with a basic set of each weapon type to allow for such experimentation. Another issue with MH3U that isn't a fault of my own this time is the graphics. The townsfolk and lands can be kind of bland. It definitely looks better with a fresh coat of HD, but still, it’s very bland. Luckily you, your weapons and your armor looks amazing. Besides you're a badass who hunts monsters, you want to look the part! The monsters also look stunning in HD and very detailed. Are there some differences between the Wii version and the new Wii U version? Absolutely. Even though you may notice a familiarization of having done this before, especially in the early goings, the Wii U version has more weapons, monsters and quests. For me, MH3U was worth the price of a Wii U system, I mean, I bought a Wii U specifically for this game. Others may find that crazy, but after playing it, you will understand why. There is so much content that I don't think I even touched in this review. There are hundreds of quests to complete, plenty of monsters to fight and a plethora of weapons, armor and items to create. I haven't tried out the multiplayer aspect yet because I've had some connectivity problems, but it's like the single player portion except with friends and to me, hunting monster with three other friends’ sounds like a blast! If you have a Wii U, go out and buy MH3U right now. If you don't and have been on the fence about buying one, it's easy to recommend doing so now. I can envision many an hour I will sink into this masterpiece of a game.